Settled In, and Ready to Blog Again! 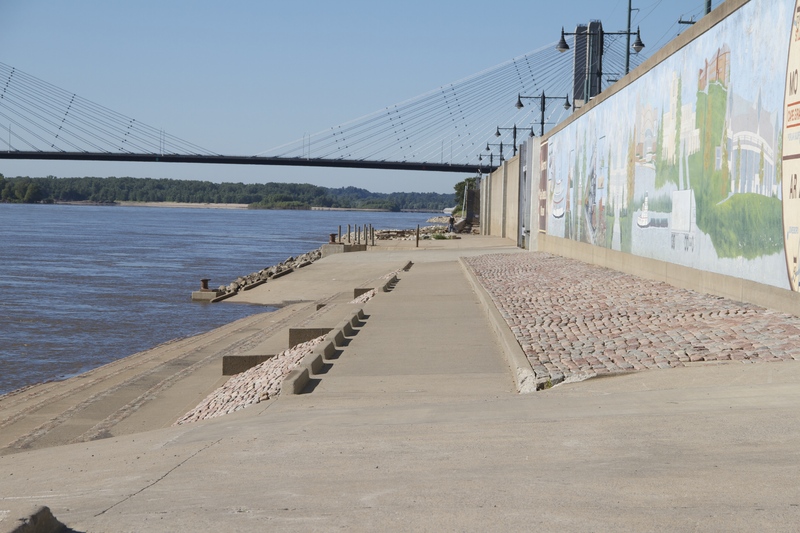 Flood wall along the Mississippi River, Cape Girardeau, MO. Greetings from DPP’s new home in Cape Girardeau, Missouri! Disasters, Property and Politics is back in business. I have moved, started a new job at Southeast Missouri State (and loving the campus and students) and am settling in to my new community. Logan Strother has completed (successfully — congratulations!) his preliminary exams, and is back to writing and researching full-time… And Randy Burnside has shifted from being the director of the Master’s of Public Administration program at Southern Illinois to working part-time in the SIU’s Provost’s Office as a provost faculty fellow and returning to his research and teaching agenda the rest of his time. In short, all of our transitions are complete, and we will be posting regularly once again. We will be posting once a week most weeks, by 5:00 on Mondays. If something big, interesting or especially pertinent comes up, we may post more than once a week. Follow us by clicking the “Follow” button in the upper left side of this page if you don’t want to check here every Monday, or feel free to follow me on twitter (@LJH1969). I’ll be tweeting links to the blog posts when they are ready. In the next few weeks we plan on bringing you a couple of reviews of books on the history of disaster policy in the United States, some reviews of recent research on issues in emergency and disaster management policy, as well as commentary on emergency management. We are also keeping track of the flooding along the Missouri (which is pretty close to home and can impact the Mississippi); volcanic activity in Hawai’i and Iceland; updates on the Colorado flood recovery (which is still ongoing); I’ll tell you about some research I’ve been doing on river training structures and why rivers change course; and we’re keeping watch over several Mississippi River flooding cases wending their way through federal court. Last but not least, it IS hurricane season. In short, we have plenty to write about. And, we have a couple of people who may join us for a week or two as guest contributors. More on that when the plans are finalized. Feel free to email me (dpphatcher@gmail.com) if you have any particular issues, questions or stories you’d like us to consider. You can nominate books for us to think about reviewing, or if you see research you don’t understand or would like to know more about — send us a link or a citation, and we’ll see if we think it’s appropriate to write about. We’re always open to ideas. Look for us on Mondays!